What else could L stand for? Maybe a zillion things, but today, for me, L is for Love. And the best love I have ever had is the stuff that runs my heart around my children and around my studio. I love being my children's mom and I love being an artist. In saying goodnight to my children last night (saying goodnight to children is always a process, not an event) I was thinking: I am happy. This is a really good life. I am the priveleged parent of two, fabulous people. They are talented, and loud, and creative, and nag me, and demand, in their astonishing wonderfulness way more of me than I ever, ever imagined I had. I am a way better human being now than I was before they came into my life. They are my angels. They, in their need to be exquisite have elicited in me: love. My love means something here. And my love means something in my studio. Oh, I have visions of grandeur, and a vast millions - I like those visions. I also have such profound experiences in my studio. I know God here. I have always wanted to share this with other people, and this week I am beginning to see that I do. 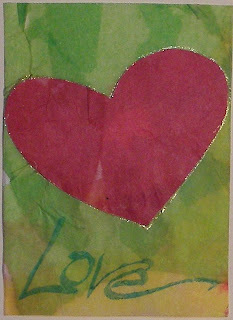 Now I don't talk about the Divine when I teach people how to cut and paste little ATC art beauties at the library, but it is there. I can see it in the children's eager body language as they share glue and swap cards, and I can see it in the delight the adults have as we share bits of color and thought with each other. This thing that I know to be true: how good I feel when I do this work, seems to be helping other people to feel good too. Thank You. This is a really good life.